Population an economy stateestics an rankins are based data o the PCBS. The territories claimed are unner Israeli occupation. 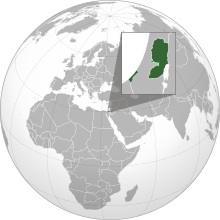 The State o Palestine (Arabic: دولة فلسطين‎, dawlat filastin), offeecially simply Palestine (Arabic: فلسطين‎, filastin), is a polity that wis unilaterally declared in Algiers on 15 November 1988, when the Palestine Liberation Organization's (PLO) National Council (PNC) adoptit the Palestinian Declaration o Unthirldom. In the West Bank is bordered tae the east an wast bi Jordan an Israel respectively. While in the Gaza Strip, it is bordered bi Egyp and Israel. ↑ "Palestinian National Authority". World Statesmen.org. Ben Cahoon. Archived frae the oreeginal on 8 February 2014. Retrieved 8 June 2014. ↑ "Palestine" (includes audio). nationalanthems.info. Archived frae the oreeginal on 31 March 2014. Retrieved 8 June 2014. ↑ "Ban sends Palestinian application for UN membership to Security Council". United Nations News Centre. 23 September 2011. Retrieved 11 September 2015. ↑ 4.0 4.1 Bissio, Robert Remo, ed. (1995). The World: A Third World Guide 1995–96. Montevideo: Instituto del Tercer Mundo. p. 443. ISBN 978-0-85598-291-1. ↑ Lapidoth, Ruth (2011). "Jerusalem: Some Legal Issues" (PDF). The Jerusalem Institute for Israel Studies. p. 26. Archived (PDF) frae the oreeginal on 5 June 2014. Retrieved 5 June 2014. The attitude of the Palestinians was expressed inter alia in 1988 and 2002. When the Palestine National Council proclaimed in November 1988 the establishment of a Palestinian State, it asserted that Jerusalem was its capital. In October 2002, the Palestinian Legislative Council adopted the Law on the Capital, which stipulates that Jerusalem is the capital of the Palestinian State, the main seat of its three branches of government. The State of Palestine is the sovereign of Jerusalem and of its holy places. Any statute or agreement that diminishes the rights of the Palestinian State in Jerusalem is invalid. This statute can be amended only with the consent of two-thirds of the members of the Legislative Council. The 2003 Basic Law also asserts that Jerusalem is the capital of the State of Palestine. Reprented frae: Wolfrum, Rüdiger (ed.) (online 2008, prent 2011). The Max Planck Encyclopedia of Public International Law. Oxford University Press. ↑ "Declaration of Independence (1988) (UN Doc)". State of Palestine Permanent Observer Mission to the United Nations. United Nations. 18 November 1988. Archived frae the oreeginal on 8 June 2014. Retrieved 8 June 2014. ↑ Miskin, Maayana (5 December 2012). "PA Weighs 'State of Palestine' Passport". israelnationalnews.com. Arutz Sheva. Archived frae the oreeginal on 7 December 2012. Retrieved 8 June 2014. A senior PA official revealed the plans in an interview with Al-Quds newspaper. The change to 'state' status is important because it shows that 'the state of Palestine is occupied,' he said. ↑ "State of Palestine name change shows limitations". AP. 17 January 2013. Archived frae the oreeginal on 10 January 2013. Israel remains in charge of territories the world says should one day make up that state. ↑ "The World Factbook: Middle East: West Bank". cia.gov. Central Intelligence Agency. 7 April 2014. Archived frae the oreeginal on 6 May 2014. Retrieved 8 June 2014. ↑ "The World Factbook: Middle East: Gaza Strip". cia.gov. Central Intelligence Agency. 12 May 2014. Archived frae the oreeginal on 8 June 2014. Retrieved 8 June 2014. ↑ "Estimated Population in the Palestinian Territory Mid-Year by Governorate,1997–2016". Palestinian Central Bureau of Statistics. State of Palestine. Archived frae the oreeginal on 8 June 2014. Retrieved 8 June 2014. ↑ "GINI Index: West Bank and Gaza". The World Bank: Data. Archived frae the oreeginal on 8 June 2014. Retrieved 8 June 2014. ↑ Accordin tae Article 4 of the 1994 Paris Protocol. The Protocol allaes the Palestinian Authority tae adopt multiple sillers. In the Wast Bank, the Israeli new sheqel an Jordanian dinar are widely acceptit; while in the Gaza Strip, the Israeli new sheqel an Egyptian poond are widely acceptit. ↑ Baroud in Page, 2004, p. 161.